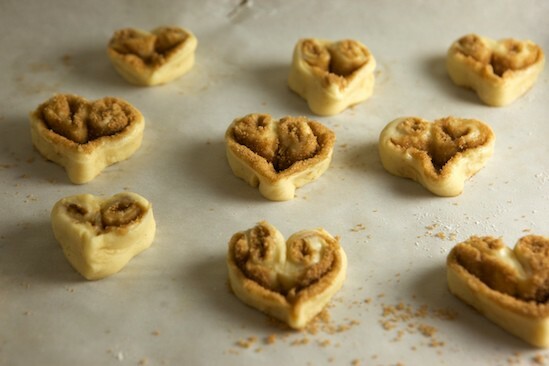 On a whim, I decided to try making heart-shaped cinnamon rolls for a fun Valentine’s Day treat. I had no idea if it would work, but I was thrilled with the results. They turned out so cute, I had to share the technique with you even if it’s a bit late to make them for today’s Valentine’s breakfast. But who says you can only eat heart-shaped food on Valentine’s Day? You can make heart-shaped rolls from any regular cinnamon roll recipe, but I happen to really like a dough made with buttermilk. I improvised the dough for these rolls from the cinnamon bun recipe in The Bread Baker’s Apprentice. Enjoy! Cream butter and sugar using a stand mixer, or in a large mixing bowl with a hand mixer, until light and fluffy; beat in egg. In a separate bowl, whisk together flour, salt, and yeast. Add buttermilk and flour mixture to the butter mixture and mix on low speed until all the flour is incorporated. If using a stand mixer, switch to the dough hook and knead on medium speed for 6 minutes, adding a bit of flour if necessary to form a very soft dough (will most likely be very sticky and that’s fine). If kneading by hand, scrape dough onto a floured counter top or board and knead, adding only as much flour as necessary to keep dough from sticking, for 8 to 10 minutes. Place dough in an oiled bowl and turn once to coat both sides of dough with oil. Cover and let rise in a warm spot for about an hour and a half. Gently push dough down to deflate and turn out onto a floured counter top or board. Press dough out into a small rectangle then cover and let rest for ten minutes. Meanwhile, mix together brown sugar and cinnamon in a small bowl. 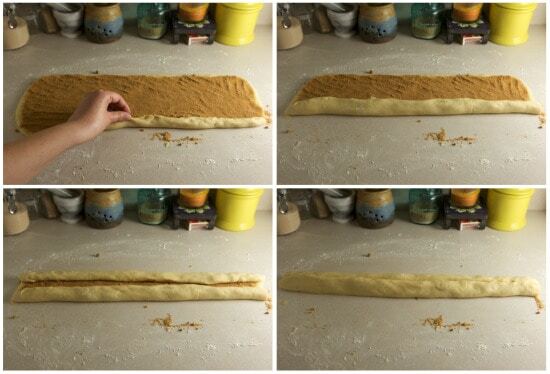 After dough rests, roll it out into a 20″ x 7 ” rectangle. 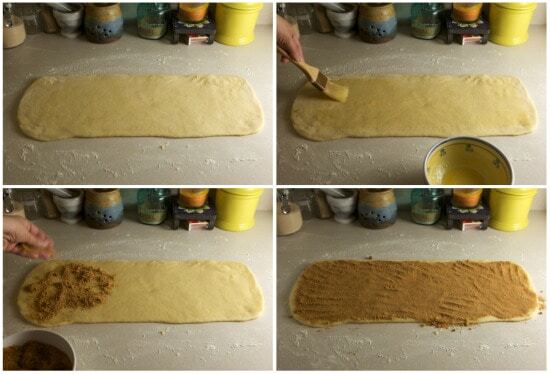 Brush surface of dough with melted butter then sprinkle cinnamon sugar mixture evenly over the dough. Gently press the sugar down into the dough with the palm of your hand. Starting on a long side, begin rolling the dough towards the center, stopping before reaching the very center. Repeat with other side then roll the two sides together until they meet in the middle. Gently press together. 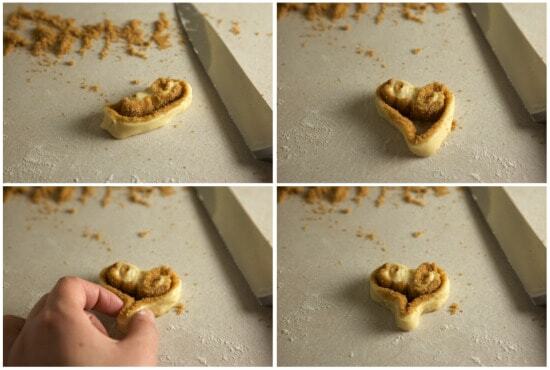 Slice the rolls into one-inch pieces then transfer to parchment or silpat-lined baking sheets. Shape the pieces into hearts by pinching the bottom of the roll between two fingers. You should end up with 20 -24 cinnamon rolls, divided between two baking sheets. Cover with greased plastic wrap and let cinnamon rolls rise for 45 minutes. Preheat oven to 350 degrees during last 15 minutes of rising time. Bake cinnamon rolls at 350 degrees for a total of 15 minutes (or until lightly browned), rotating sheets from top to bottom halfway through baking time if using two oven racks. splash of milk to thin, if necessary. Beat together cream cheese and butter until light and fluffy. Add vanilla then gradually beat in powdered sugar. Spread glaze on warm cinnamon rolls and serve immediately. You may also thin the glaze with a bit of milk to drizzle over the rolls, or decorate cooled rolls using a piping bag and round tip as shown below. These are truly adorable. Cinnamon rolls never go out of season. And neither do hearts. Therefore, I'm pretty sure these could be served year-round with no adverse side effects.I am SO bookmarking them! 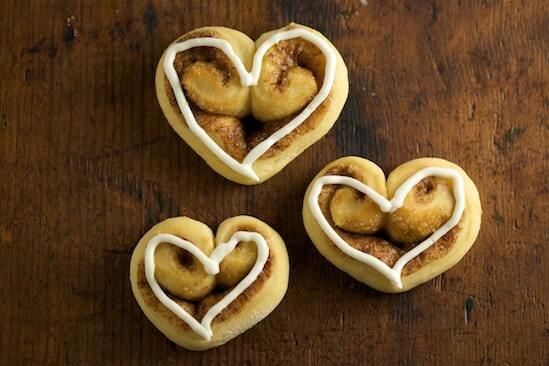 I love your heart-shaped cinnamon rolls! So festive and creative. Cute buns! I love the whimsical shape. They turned out beautifully! Once my own buns recover from all the BBA breads I'll give these a try. Very cute! Perfect for Valentine’s Day. I ended up making some heart-shaped pancakes this morning. Completely charming. 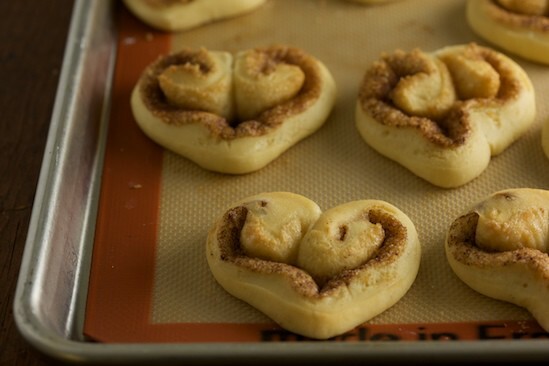 Who wouldn't love to wake up to a heart-shaped cinnamon roll any time? Absolutely adorable. Totally agree that heart-shaped food shouldn't be confined to one day a year! These are fabulously cute. Such a good idea! I definitely will have to use these as inspiration to make some cinnamon rolls again soon. Love these! And it works out great since our Valentine's Day celebrations are delayed due to some untimely illnesses! We might have to whip these up for our belated brunch celebration! Thanks for being so clever! Aww so cute! And they look like they're smiling! I love the cinnamon rolls. I recently ordered the book The Bakers Apprentice because of your site and the wonderful breads that were created. Thank you. HOW CLEVER... saving this idea! They look delicious! I am definitely saving this recipe. What a great idea! I'm defiantly trying this one. A perfect treat for Valentine's Day! Really adorable idea! Glad they worked out! I just love these and will definitely make them! Made apple cinnamon muffins this morning and they are almost gone! Hearts are great all year..I agree! Anything cinnamon always works for me! ;) These are so cute and creative, am glad they turned out so well! Oh my gosh! That is about the cutest thing I've ever seen! I am definitely going to try this next year! Good idea. I bet they taste as good as they look. those are just too cute for words. love the idea - very creative. You are so the Queen of adorable edible things! Love this! Your blog is so wonderful. Thanks for the great photos/ideas. How sweet is this.. love the idea.. simple and so effective!! I can't help but smile when I look at these. So cute! What are a really neat idea, I love cinammon swirls, and these look really tasty, it's a clever idea to make them into hearts, i'm not sure about using non pareils, I think the white icing alone look better - great blog, thank you. That is a really cute (and delicious) idea! Am going to copy it now and make it first chance I get....Valentines Day or not. I'm catching up on my RSS reader a bit late this week... Even though I missed Valentine's day I had to leave you a comment to let you know that these are absolutely adorable! I think I'll save this recipe and make these for my hubs for his birthday or our anniversary! Cinnamon rolls are the ultimate aphrodisiac for my husband--he would have loved waking up to these on Sunday. Thanks for the idea for next year! Such a cute idea and impressive....with a simple trick! I love it. Only... I wish I'd come up with it. But I will for sure be using this idea for Valentine's to come! How cute! I've never made homemade cinnamon rolls, but have always wanted to try! Aw those are precious! And it's looks so easy to do, I am suprised I haven't seen more like that. What a special way to start the morning! These are adorable! So perfect for v-day. I love what you did with the cinnamon rolls! They are so cute! these are just FANTASTIC!! prettiest cinnamon rolls ever. I wish I’d come up with it. But I will for sure be using this idea for Valentine’s to come! What a cute idea -- they look delicious! Double wow. On Twitter, did I see you call yourself a slacker?! 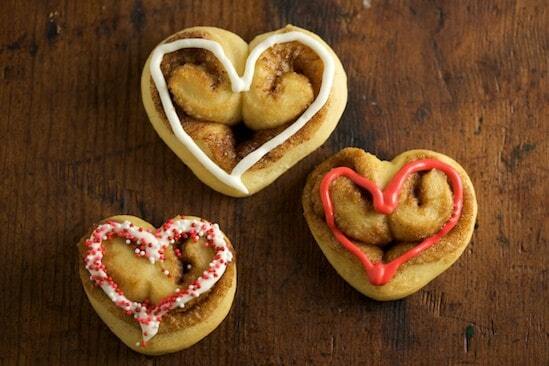 Um, slackers don't take the time to make the cutest heart-shaped cinnamon rolls of all time. What an adorable idea! Can't wait to try this!! What a super sweet idea!! They're adorable and I will be making them for my anniversary this year, and add them to my list of Valentine treats! Thanks! I was going through all of the sites that are going to be in the 55knives book and stumbled across yours. Those cinnamon rolls look delicious!! I will definitely try this, since I love cinnamon rolls, and this is something that you can do even when the Valentine's season is over, just play up with other shapes and designs! Nicole, these immediately made think "Dr. Seuss"! I'm sure they were fantastic! That's right, heart-shaped food should not be reserved only for V-day. Something this lovely would be a great treat any day. I love cinnamon rolls and I often make them but I have never thought I could make such nice hearts! And the decorations are so cute. Next time I am going to try it this way. I absolutely love this! I want to make these for no reason right away! Brilliant! I am SO making these this weekend! I adore cinnamon rolls but all too often I shy away from making a batch because I know that I’m committed to a full tray of BIG rolls. Often times they feel like a full meal. With these I’d be inclined to pop them in the freezer and pull a few out when we fancy one without worrying about polishing off an entire tray of big rolls. One of the best ideas I’ve seen in a looong time. Thanks so much! Hi! I suppose I recently found this post from a link on another blog (sorry I don't remember which one). I really like this recipe, but curious about how on earth they can be made fresh and ready first thing in the morning... short of getting up at 4:00am. Any ideas?thanks! What an incredibly fun idea! Can't wait to make them. :) I'll be featuring them today, thanks for sharing the tutorial! great idea, glad to find it this year even if it was too late in 2010! Hey LOVE this idea! It's going on my blog. Thanks for the inspiration!! They look so pretty! I always seem to mess things up with the yeast, but next time I give it a go I'll try to make these ones. Oh, Erin, don't worry! Mine looked absolutely horrid too, but my husband ate them right up. They ended up being pretty tasty though they looked a mess. These look wonderful and I'd love to have some ready for my family before school on Friday. Is it possible to do any of the steps the night before so that you just have to bake them in the morning? I'd love any suggestions---thank you!